Be the first to share your favorite memory, photo or story of Laura . This memorial page is dedicated for family, friends and future generations to celebrate the life of their loved one. 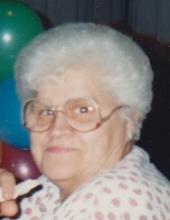 Laura Elizabeth “Bubbles” Oberholser, age 88 of Clarence, passed away on Wednesday April 3, 2019 at Mechanicsville Specialty Care. Funeral services will be held on Monday April 8 at 10:30 A.M at Clarence Methodist Church with Pastor Carol Mart officiating. Burial will follow at the Clarence Cemetery. Visitation will be held on Sunday April 7 from 4-6 P.M at Chapman Funeral Home in Clarence. Laura was born on January 14, 1931 to Myron and Galilee (Moore) Britcher in Clarence, Iowa. She married Burrel ”Lou” Oberholser on July 29, 1954 in Waterman, IL. He passed away on October 16, 1988. Laura was a member of the Clarence American Legion Auxiliary and lived her whole life in Clarence. She worked at Casey’s for over 25 years, taught Sunday School for many years, and was a great cook, especially her potato salad! Laura also loved her family dearly. She is survived by her sons, Danny (Diane) of Mechanicsville, Kerry (Cecelia) of Clarence, Jimmy (Judy) of Cedar Rapids, and Tommy of Anamosa; 11 grandchildren’ 11 great grandchildren; and sister, Rebecca Long of Cedar Rapids. Laura was preceded in death by her parents; husband; five brothers; and a sister. To plant a tree in memory of Laura Elizabeth "Bubbles" Oberholser, please visit our Tribute Store. "Email Address" would like to share the life celebration of Laura Elizabeth "Bubbles" Oberholser. Click on the "link" to go to share a favorite memory or leave a condolence message for the family.